Located on the Northeast coast of the Sunshine State, Jacksonville, Florida is an affordable coastal getaway sure to please the masses. With 22 miles of white sandy beaches, a plethora of professional-grade golf courses, and a rich & charming cultural scene, it’s no wonder Jacksonville takes a spot on the list of “21 Supercool US Cities.” Jacksonville International Airport follows suit with stunning art installations, rich and delicious dining options, and fantastic shops that turn JAX into a destination of its own. Here at InMotion, we care about making sure your travel experience is superior from start to finish, and that’s why we’re giving you a guide to the best-of-the-best at Jacksonville International Airport and the must-have tech accessories for your every adventure. When it comes to traveling, we all too often find ourselves snacking on unhealthy convenience food that leaves us lacking energy for vacations and business trips. That’s exactly what PGA Tour Grille looks to prevent as they serve fresh, healthy food to travelers in Concourse C of Jacksonville International Airport. Inspired by the vitamin-rich diets of professional golfers and other athletes, the PGA Tour Grille creates a refreshing dining experience of travelers of all demographics. Serving dishes with everything from quinoa to pomegranate to arugula, their food is designed with active lifestyles in mind, making is great for travels ready to take on the everyday adventures available in Jacksonville. 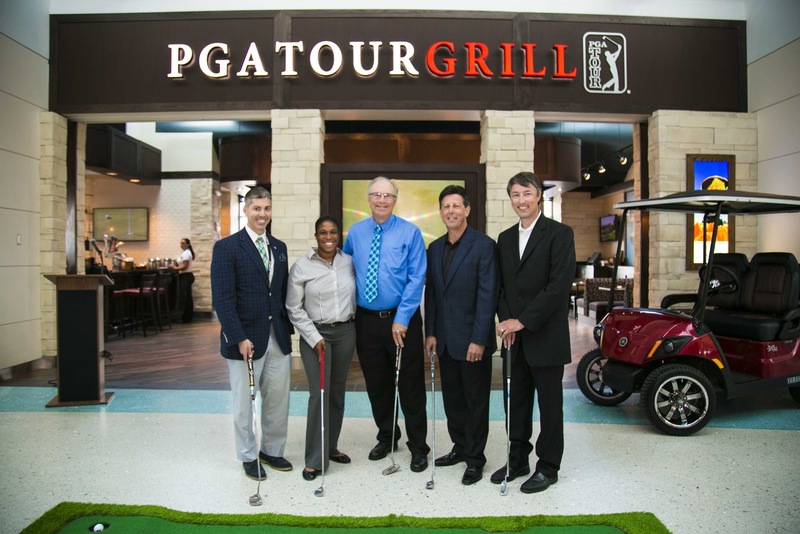 In addition to tasty food that keeps you energized, PGA Tour Grille serves golf-inspired cocktails packed with even more fresh ingredients, making this airport dining experience a hole in one. While recharging your body, don’t let your device fall far behind. For easy, portable charging from a brand we trust, the myCharge HubMini 3350mAh Portable Charger is no brainer. With both a built-in Apple lightning cable and MicroUSB cable, you can charge up to two devices at once in one compact device. 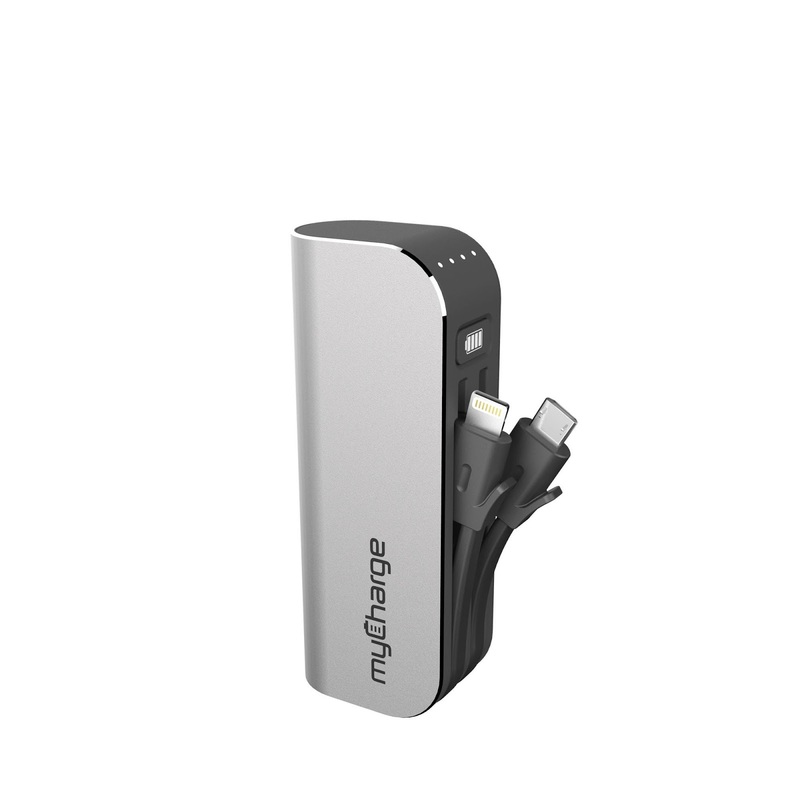 Holding up to 2x extra battery life, the myCharge HubMini 3350mAh Portable Charger charges devices up to 65% faster than competitors and uses Smart-Sense technology to ensure compatibility with your device. Great to use for your everyday travel needs or an emergency charger, the myCharge HubMini 3350mAh stores power for up to a year in its super light body, allowing you to travel worry-free and experience the best that Jacksonville has to offer. Featuring a variety of shops for travel must-haves and passing time before flights, Jacksonville International Airport has a retail experience for everyone. One of our faves: Located in Concourse A is Insight, a variety store full of jewelry, keepsakes, and accessories with a sweet beachy feel. 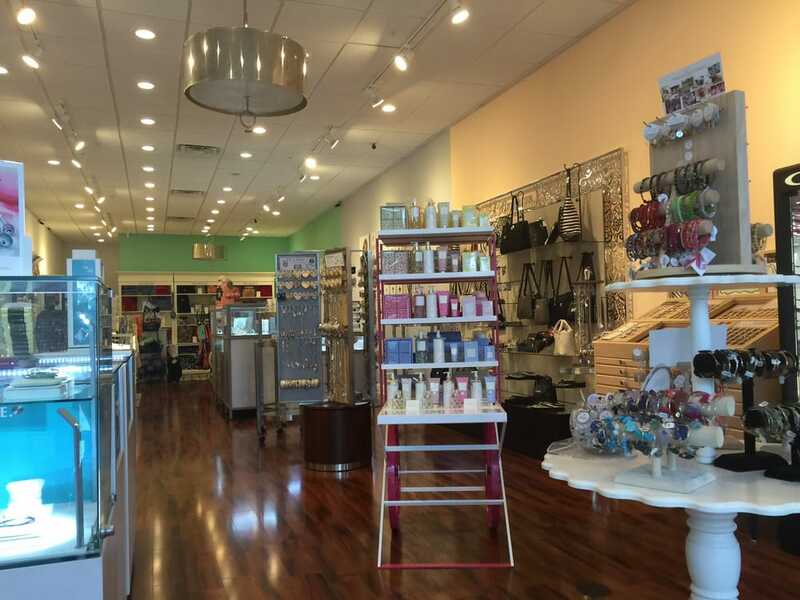 As a vendor of Pandora, Vera Bradley, Lilly Pulitzer, Simply Southern, and more, Insight has perfect gifts for friends or accessories for gearing yourself up for a relaxing trip to Jacksonville. Along with bringing you cute keepsakes from your trip, you’ll be greeted with warm service than feels like family. Having plenty of stores for passing time between flights isn’t the only necessity while traveling. 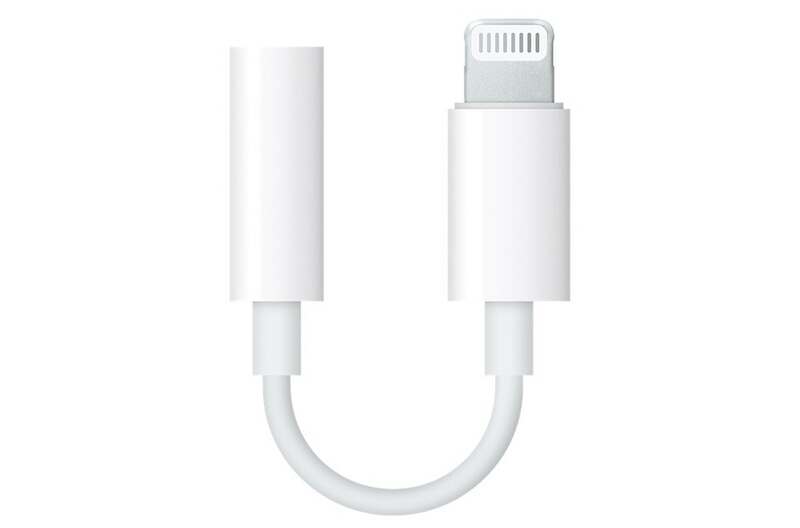 Something iPhone users simply cannot live without is a Lightning to 3.5 mm Headphone Jack Adapter. Since the switch from a 3.5 mm headphone jack to a lightning cable charging and headphone adapter, iPhone users have needed this additional accessory to make traditional headphones compatible with their iPhone. The Apple Lightning to 3.5 mm Headphone Jack Adapter is the travel companion to keep in tote for all your adventures to ensure a worry-free connection from your phone to your headphones for travels full of your favorite music and podcasts. Airports are so much more than just a place to catch flights. They’re a center of human activity: meetings with loved ones after months apart, places of anticipation for the next adventure, and cultural hubs for arts and entertainment. At Jacksonville International Airport, you can find a variety of stunning art installations that reflect the energy of Jacksonville itself. One of the largest installations includes “Gotta Go” by Gordon Huether. Created in 2008, Gotta Go depicts on two different 35-foot arched windows a man and a woman on the go in the airport. 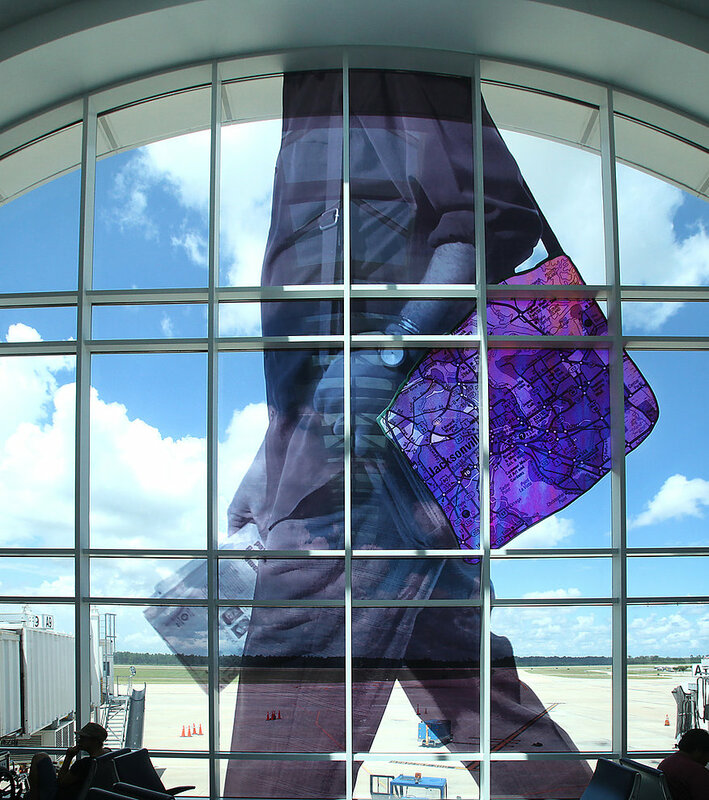 Each person depicted carries a bag with a map of the jacksonville area that reflects in different colors depending on the time of day, making for a larger-than-life spectacle that captures the spirit of travelling and adventure. When you ‘gotta go’ and want to keep your favorite tunes with you, try the JBL Reflect Aware in-Ear Sport Headphones with Lightning Cable. 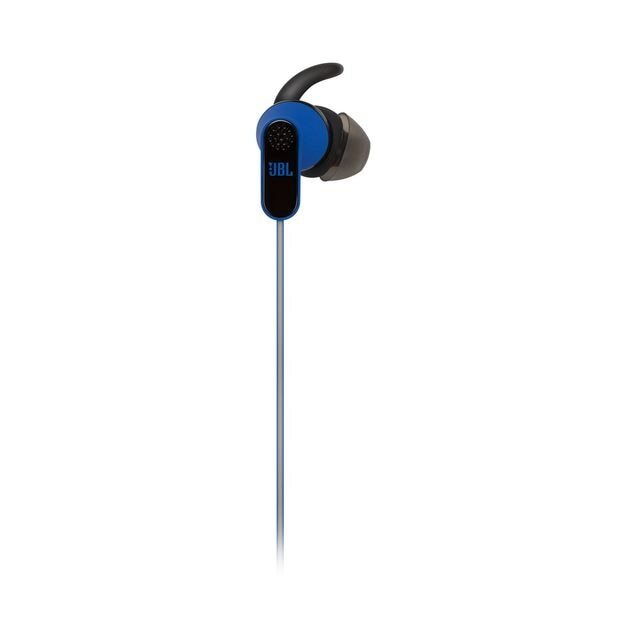 These iPhone-compatible headphones provide you with the high-quality sound we know and love from JBL with noise canceling and adaptive noise control that allows you to still hear important noises from your surroundings. With sound and power delivered right from your iPhone, the JBL Reflect Aware in-Ear Sport Headphones with Lightning Cable move sound from your device to comfortable, ergonomic ear tips with tangle-free reflective cables that will always allow you to stand out. To ensure that you stay moving, these headphones are sweat and water resistant and ready to take on your next journey with you. When you’re travelling, there’s nothing worse than not having your favorite technology in tote. 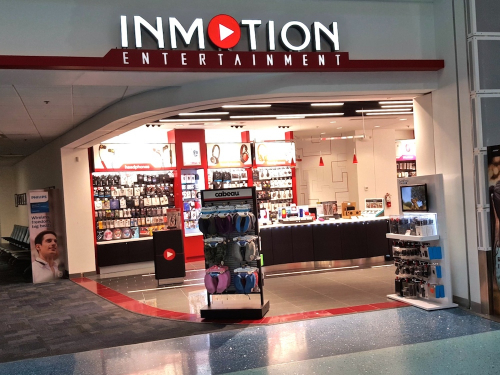 For all of your tech needs while travelling, stop into InMotion in Concourse C. We carry everything from Apple accessories, Beats by Dre Headphones, to Travel SIM cards to make sure your journey is enjoyable and connected to loved ones. Our expert associates are ready to help you find the tech you need at Jacksonville International Airport for the trip of a lifetime.